Attorney general: Findings in new report on youth violence are "staggering"
CHICAGO, Illinois (CNN) -- U.S. Education Secretary Arne Duncan met Wednesday with a group of teens who were schoolmates of a Chicago youth brutally beaten to death last month. 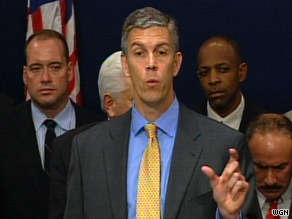 Education Secretary Arne Duncan speaks during a news conference in Chicago on Wednesday. "I can't tell you how impressed I am. We had a great conversation," Duncan said at a news conference. "These are kids that are overcoming odds that folks in this room have a hard time even comprehending." He and U.S. Attorney General Eric Holder also met with Chicago's mayor and community leaders to discuss possible remedies for violent crimes involving young people. The Cabinet members' visit, ordered by President Obama, was prompted by the beating death of Derrion Albert, a 16-year-old honors student. Authorities said Derrion was caught, unwittingly, in the middle of a street fight between two factions of students from Christian Fenger Academy High School on September 24. The beating was videotaped with a cell phone. His death was not an isolated incident: More than 30 youths died violently in Chicago last school year. "Nearly two weeks ago, this nation was shocked, shocked by a video showing scenes of such graphic violence that they left an indelible mark in the mind of every American who has seen them," Holder said at a news conference. For many who live with the threat of daily violence, he said, the video was a sad reminder of the harshness and cruelty that remains all too prevalent in many parts of this country. "For others, it was a stark wake-up call to a reality that can be easy for too many to ignore as they go about their daily lives," Holder added. "For me, it was a call to action, to address a challenge that affects the whole nation." Activist praises Derrion's "different attitude"
Youth violence is not a racial or income problem, the nation's top law enforcement official said, "it is an American problem." The Department of Justice on Wednesday released a study that measures the effects of youth violence. The findings are "staggering," Holder said. He said 60 percent of the youngsters surveyed had been exposed to violence, directly or indirectly, in the past year; nearly half of the adolescents said they had been assaulted at least once, and more than one in 10 were injured as a result. "Those numbers are astonishing, and they are unacceptable," Holder said. The survey of more than 4,500 children ages 17 and under, or their parents or caregivers, was conducted between January and May 2008. Duncan, who was chief executive of Chicago Public Schools before joining the Obama administration, said he met with a dozen teens and parents from Christian Fenger Academy High School and had an "honest" and "emotional" talk. A desire for mentors and the need to feel safe were uppermost on their minds, Duncan said. How can authorities reduce crime and keep young people safe in Chicago? “AC360” investigates. "So many of our children have lost faith in the future," he said. "It's difficult to show love when you haven't been loved." "Child after child talked about 'my mother died, my father died, I've been raised by grandparents, now I live in some other place,' " the education secretary said, adding that some children are living in homeless shelters. "Another young man ... talked about how his family is part of the problem, his family is pulling him down, [but] he's doing what he can to rise above that," he said. Chicago Mayor Richard Daley told reporters that much of the youth violence in Chicago involves gangs. He said he would like to see more adults become mentors to troubled youths, and for more opportunities to be made available to young people after school and on Saturdays. In May, the Rev. Michael Pfleger of St. Sabina Church hung the American flag outside his church upside down as the teen death toll for the 2008-09 school year climbed into the 30s. He spoke to CNN at the time, after 15-year-old Alex Arellano became the 34th fatality. Pfleger's foster son Jarvis was shot to death in 1998, three blocks from the church, the pastor said. When he arrived at the scene, Jarvis was lying on the sidewalk, bleeding from his neck. Last week, CNN spoke again with Pfleger, who said the flag is still upside down. He chose an American flag, he said, because the problem of youth violence is not limited to Chicago. CNN.com's Eliott McLaughlin contributed to this report.